フルーツレシピ - Welcome to GreenPower Juicer! The lychee, also spelled 'litchi' or 'lichee' grows on an evergreen tree that has been cultivated in China for thousands of years. Then juice lychees and grapes. First place the Fruit Screen onto the twin gears. At first, wind the White knob completely in by turning clockwise. Wind out the knob about halfway after a few drops of juice have come out. This juice is very sweet and contains a lot of natural fruit sugar. It is great for afternoon tea to boost yourself for the rest of the day. You can also use longan or rambutan instead of litchee fruits. Rambutans are not as juicy but their seed is very easy to remove. Juice the entire grape as the seeds contain valuable nutrients. Litchees are an excellent source of vitamin C and also provide small quantities of dietary fiber. White Grapes contain rare key elements such as copper, fluorine, manganese, phosphorus, calcium, tartaric acid and flavonoids. The seeds of grapes contain phosphorus and should therefore be eaten or juiced. Seedless grapes miss out on the benefits of the seeds. This 'spider' is a magnificent fusion of color. Serve it to a group of people at a time as the color variation is magnetic. First place the Juicing screen over the twin gears. When you change over to the mincing function you don't have to clean the machine in between replace with the crush screen. Juice the oranges and fill 2 glasses. Then make a blueberry-banana ice cream by letting the frozen fruit run through the mincing function twice. Make 2 ice cream scoops with a spoon and place them gently into the orange juice. If you are catering to a bigger group of people, make a jug of orange juice and a smaller bowl of the frozen blueberry ice cream. Your guests can help themselves and make their own 'spiders' which is a lot of fun! Ice cubes and fresh blueberries can be floating in the orange juice as a great little extra. The dark red color is just as inviting as the exotic taste of this juice. 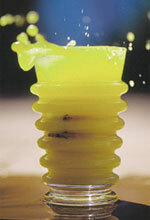 Sweet and sour compliment each other in a delightful way and make this juice rather addictive. A natural high without having to drink blood! Makes 2 glasses. Crisp apples juice much easier than over ripe apples. 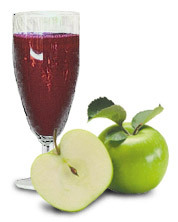 The best time to make fresh apple juices is when the apples are harvested totally fresh. The seeds of the raspberries don't disturb the juice but you might want to consider using seedless grapes for this recipe if you are sensitive to finer tastes. Grapes with seeds are part of Mother Nature's original product and contain valuable phosphorus. The decision is up to you and you may change from day to day as your taste buds vary. To decorate your drink, hang two grapes from the rim of your glass. Apples are known to assist the body in building resistance to infection as they stimulate the digestion. They are also known to help with weight loss. Berries help to keep the blood alkaline.